Posted on December 4, 2014 at 5:43 pm. The festive season is upon us, and the online casino scene knows how to embrace the Christmas spirit, too. Playing Yuletide themed pokies and special Xmas table games for real money is a great way to build up to the 25th December – maybe you’ll even be able to buy yourself a Christmas pressie! At this time of year, the best virtual casinos will release new, seasonal games for you to play. These are our top gambling game picks to play in the lead up to Christmas (and for the month of December), all of them are fun, can be played in practice mode, are festive and can be played online from the comfort of your own home. Play for free or real money at www.Guts.com. 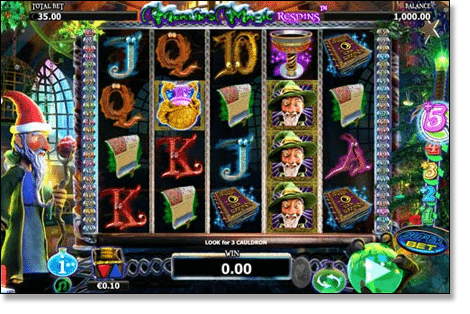 This is our Xmas slot of the month – a 5-reel, 4-row video slot game that takes the Christmassy theme to the next level. It has lively, magical sound effects and animations like twinkling Christmas tree lights and falling snowflakes. Merlin has traded in his usual wizardry hat for a Santa Claus hat, and there are holly plants bordering the game. Hit the heart balloon button, next to the Autoplay feature, to play the bonus side game. In the bonus game, you can bet on red or black or one of the card suits, then hit the deal button to see if you guessed right – it’s a quick and fun way of winning extra credits for the main slot game. Click on Merlin’s Sword on the right hand side of the screen to activate the Superbet function, which can win you more free spins and will multiply (up to five times) any winnings made. Wild Respins occur if at least one level of the Superbet function is selected. This game is a new creation from NYX Gaming. Play the game at Casino-Mate.com or 7SultansCasino.com. If you’re a fan of the hit TV show Game of Thrones you won’t be disappointed by the pokies version of the game. Even if you aren’t familiar with the show we’d still recommend giving it a spin. It is one of the most anticipated pokies games to come out and it lives up to the hype. The background music is instantly recognisable as the Games of Thrones theme song and like the show,the game is dark, sombre and captivating. It’s an incredible game, with both a 15 payline and 243 ways version available to play. There are four different icons which unlock a round of Free Spins: three Baratheons, three Lannisters, three Starks or three Targareyen will unlock different numbers of free spins and have differing multipliers on each. 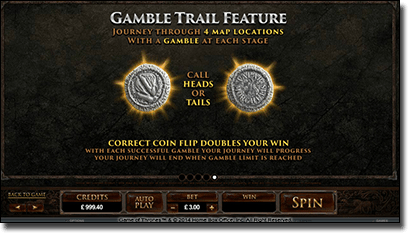 The game is a journey – there’s four different ‘locations’ you traverse each time a round of Free Spins is triggered. In this bonus game you call head or tails before a coin is flipped, and if you guess right then any winnings made during your Free Spin round are doubled. This Microgaming pokies game is one of the most graphically-advanced slot games released yet. A recently released Microgaming pokies game available at Guts Casino, this quality slots game has great graphics, audio and gaming features – and has a very sweet Xmas flavour throughout the game. Icons in the game are different gingerbread characters carrying out different Christmas activities, like decorating a Christmas tree. It’s a 5-reel, 3-row pokies game with 35 paylines. You can adjust the number of coins bet from 1-10, and alter the coin value from 0.01 – 0.20. There is a Bet Max option which will maximise the coin number and number of bet lines for you. Three or more Gingerbread Lane symbols will unlock the Free Spins feature as well as the Christmas Present Bonus Game. In the bonus game you pick a present box for your gingerbread man to open, and each present will contain a unique prize. Prizes in the boxes include additional free spins, a multiplier for your next payline wins, or free coins added to your jackpot. If you activate another Free Spin round while Free Spins is underway, you get to play the bonus game again. Play Gingerbread Lane at Guts Casino. Play this elegant European roulette title at 7SultansCasino.com. This isn’t a Christmas-themed roulette game but it’s a quality online roulette game with premium graphics, perfect animations and classy background music. 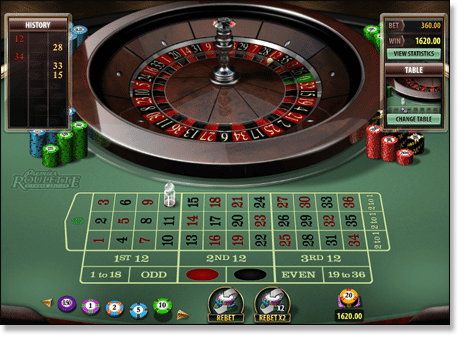 It’s one of the newest table games to come to Microgaming powered online casinos and is an excellent addition to existing roulette variants. The game runs just as you would expect a European roulette game to run, you place your bets on the betting table and hit spin when you’re ready to play. Betting chips range from $0.25 – $1000, with chips of varying values in between. You can use any combination of chips you want to customise your betting amount. There is also the option to rebet (which keeps your previous rounds chips in place) or rebet x2 which will double your chip amounts. The graphics and sound effects help to create an authentic gambling experience, and as a whole, this game gives a lifelike depiction of what playing roulette at a brick-and-mortar casino is like – without other boisterous punters, that is. This is one of the best online roulette games you can sink your teeth into this December. The holiday season is a busy time of the year so it’s nice to unwind with a table game that requires an element of skill, so you can take your mind off your to-do list and just relax. This blackjack variant definitely has enough going on to distract you. It’s available at 7 Sultans Casino where you can play for free or for real money. In this variant you can split your cards three times to play four different times, or you can just keep it to one hand if you feel like keeping it simple. Play Vegas Download Multi-Hand Blackjack at Casino-Mate.com.